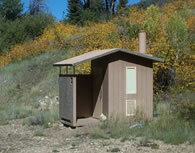 In the latest skirmish over a long-disputed dirt road in the Humboldt-Toiyabe National Forest, Elko county-rights activists are fuming over the Forest Service’s decision to clean a remote outhouse. The county and the Forest Service have clashed since 1995, when the agency closed a 1.5-mile stretch of South Canyon Road after most of it was washed out by a flood. The Forest Service decided repairing the road would wash debris into the Jarbidge River and damage important habitat for the threatened bull trout. But a group of county-rights activists, dubbed the Jarbidge Shovel Brigade, fought to re-open the route — even convincing Elko County to bulldoze parts of it (HCN, 10/25/99: Nevada rebellion ends with a whimper). Since then, the Forest Service has agreed to consider re-opening the road; an environmental impact statement is due out this year. In the meantime, the Shovel Brigade found a new excuse to get access to the area. In August, at the brigade’s request, the Nevada Division of Environmental Protection asked the Forest Service to empty an outhouse at the end of the disputed road. Brigade members volunteered to remove eight years’ worth of waste (some two-and-three-quarters tons) from the vault toilet on Oct. 18, using horse-drawn wagons. But forest supervisor Bob Vaught says the task carried too many environmental and health risks to enlist volunteers; he hired a helicopter to complete the job on Oct. 10 “to avoid some kind of a confrontation.” State assemblyman and brigade member John Carpenter believes the heli-pumping, which cost $15,300, was a waste of taxpayer money. “We were going to do it for nothing,” he says. On Oct. 18, the brigade broke ground on a new fight, with a round of print and radio ads warning citizens to beware of “armed and dangerous” Forest Service officers issuing citations for off-road travel.